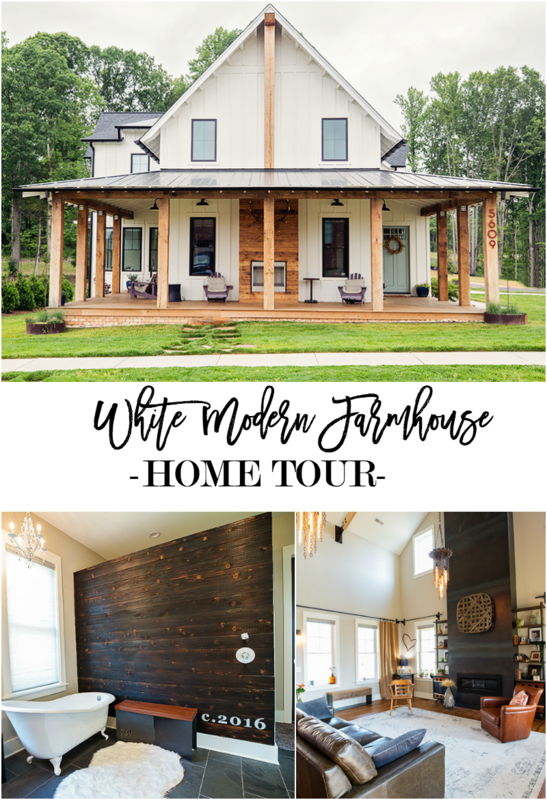 Take a home tour of this custom, white modern farmhouse designed by a couple of artists with eclectic and fun taste! 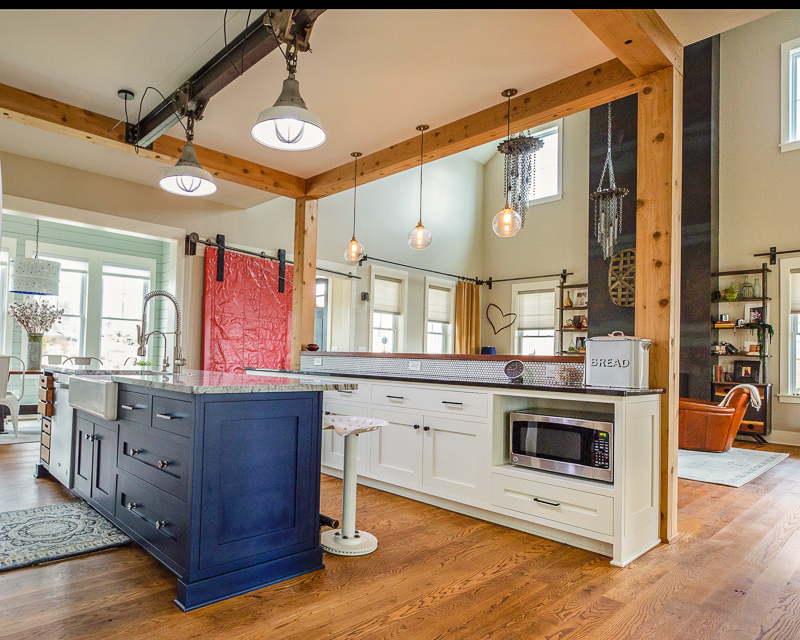 Brian worked together with Henderson Custom Homes to design this incredibly unique contemporary home, but as you’ll soon see this isn’t your typical industrial farmhouse. 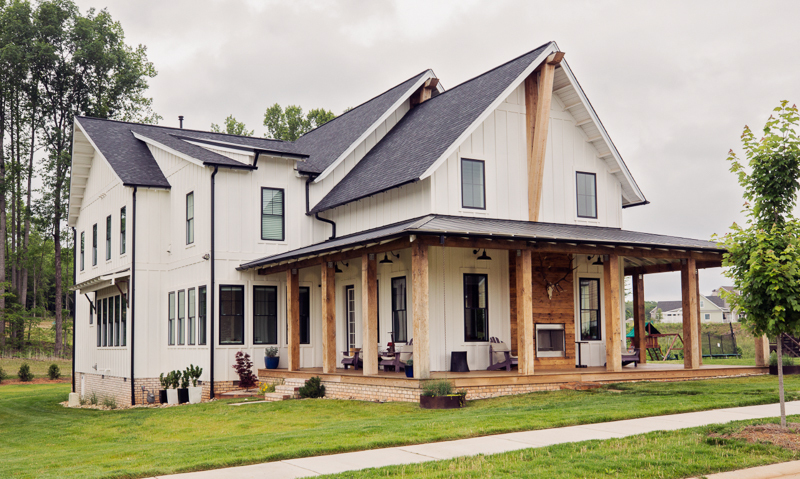 This home is more like Soho Loft meets Modern Farmhouse! 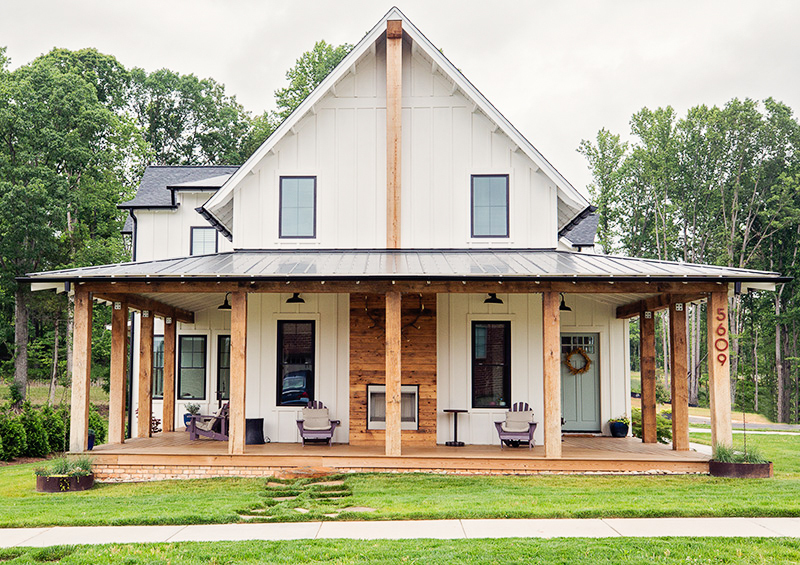 The first thing I noticed about the beautiful exterior is the gas fireplace in the center of the porch!  I’ve often seen outdoor fireplaces in backyards and patios, but what a unique and cozy idea to make the fireplace the focal point at the front of the home! Brian and Becky often enjoy porch sitting and the fireplace ensures a cozy and warm space year round. 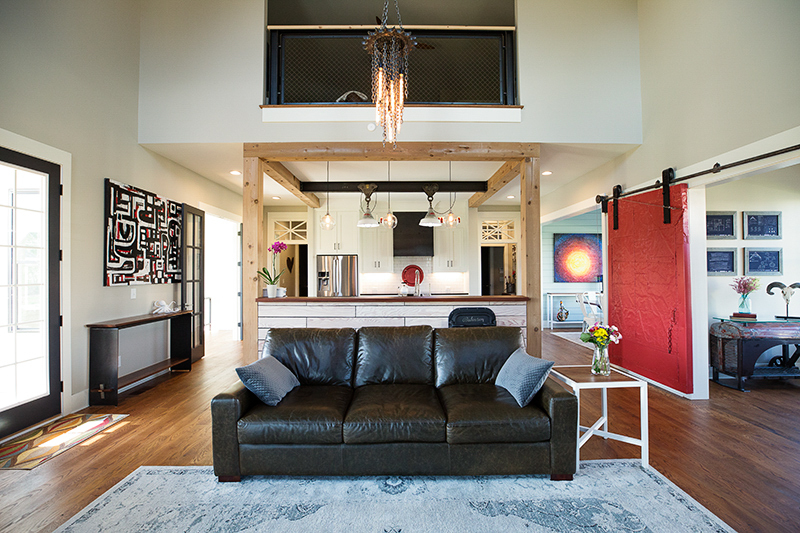 Upon entry, you are immediately embraced by the dramatic great room and open floor plan. 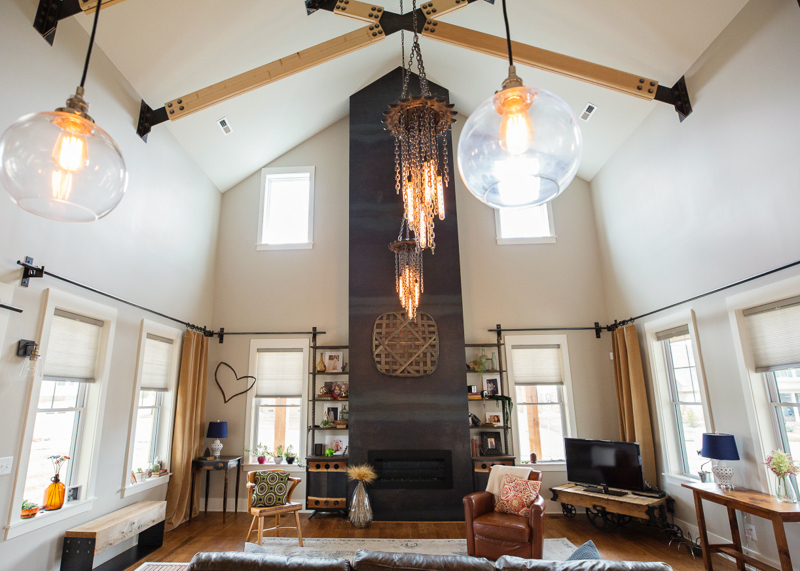 Many of the fixtures and furnishings in the home are designed and created by Brian, including the gear and chain chandeliers, shelving units, and cedar beam bench. 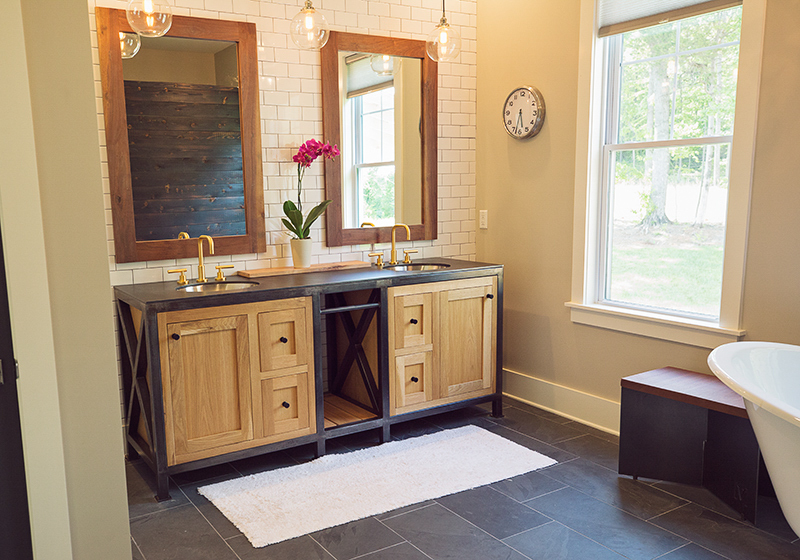 You can visit his handmade furniture site at Vise & Co to see more of his work. 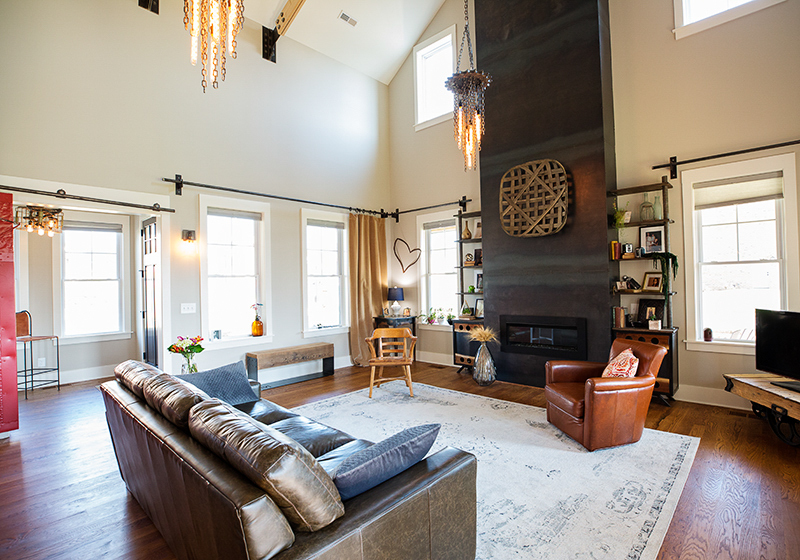 The floor to ceiling fireplace is metal-clad and a total showstopper! 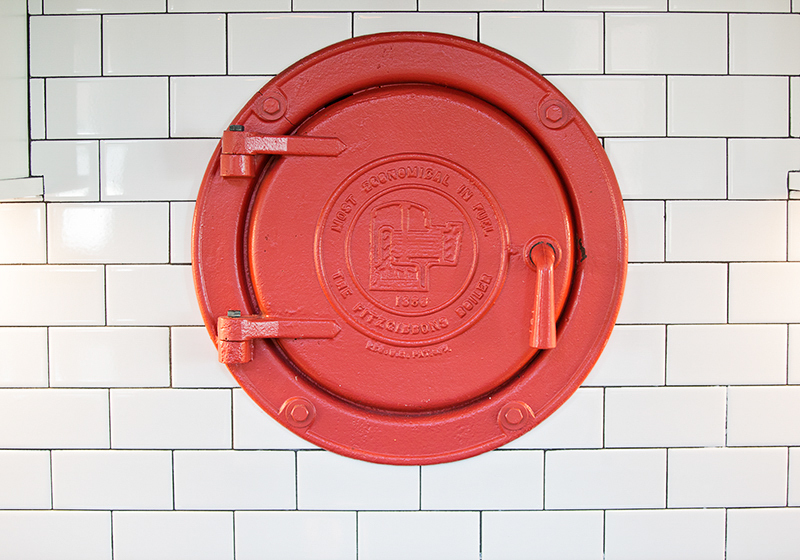 From this angle, we look back on the home’s side entry which is sectioned off by a repurposed fire door painted a bright, fire-engine red. 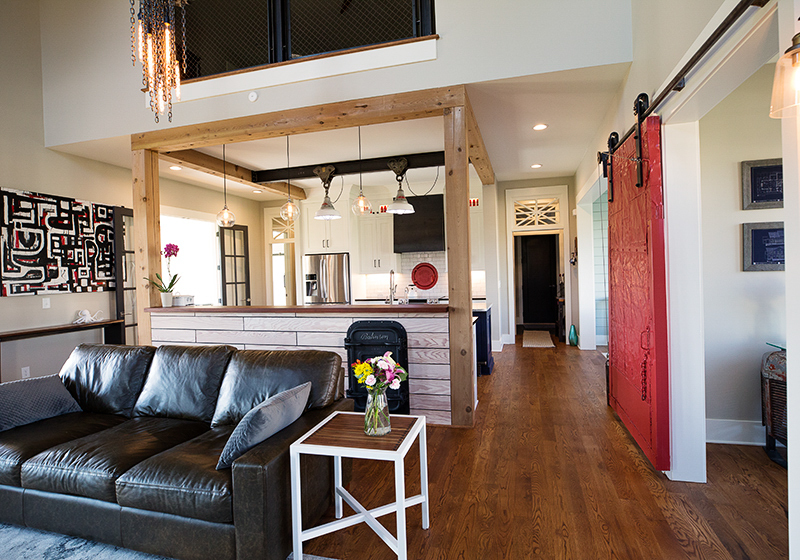 Pops of color, sliding doors, steel metallics, rustic decor, and warm woods make for a contemporary modern farmhouse with strong urban vibes! 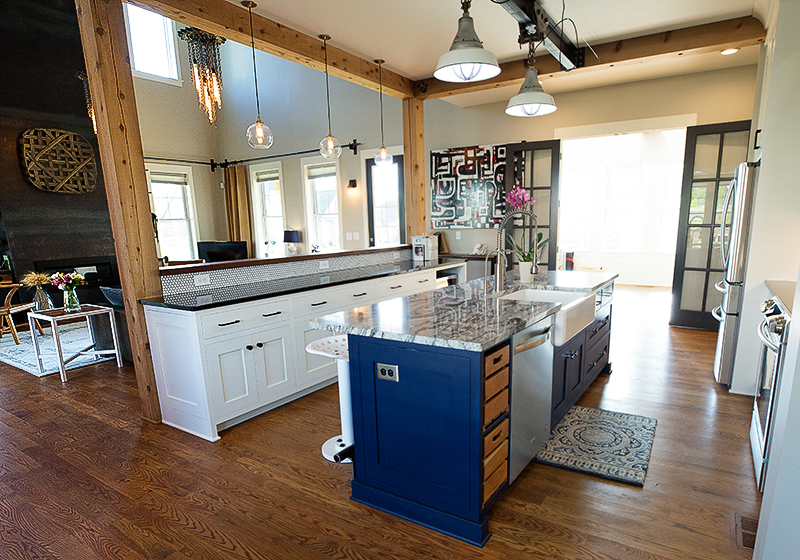 You can see that each room has a playful and eclectic mix of furnishings–the kitchen being no exception! 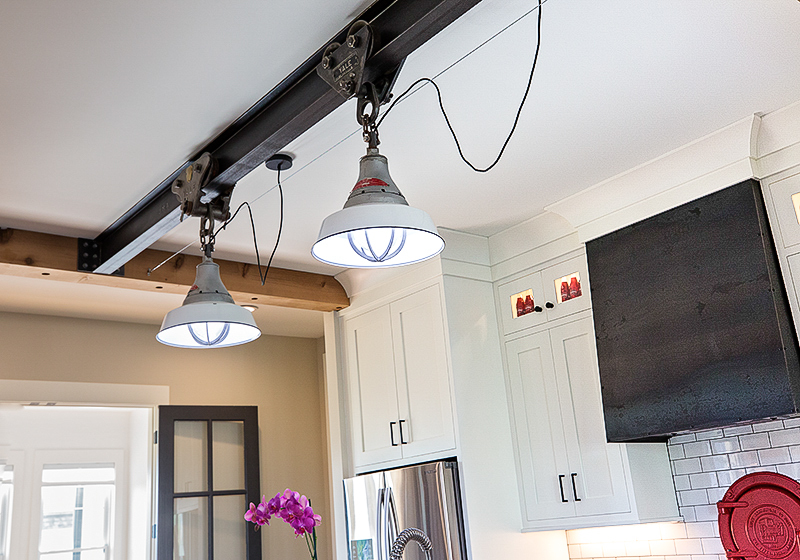 Vintage pendants hang over the kitchen island from antique track hardware. The comfy tractor seat stools are a Vice & Co original design! 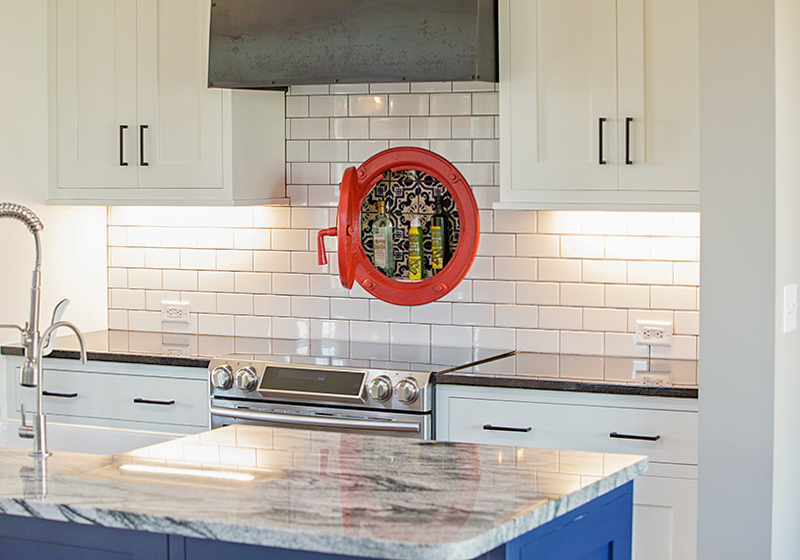 An antique Fitzgibbons boiler door was installed behind the range in the subway tile backsplash and now serves as a cute spice rack! How clever! 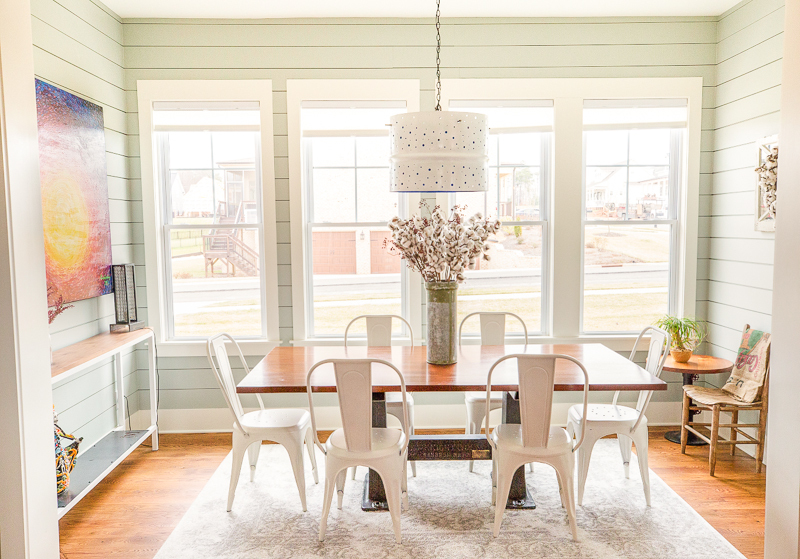 Unlike many of the neutral modern farmhouses that we see splashed all over Instagram, this family isn’t afraid to play with some color! 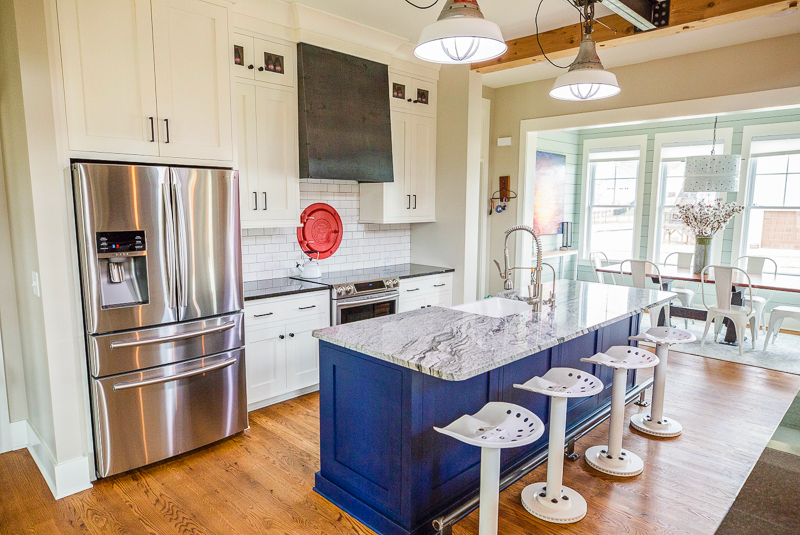 The kitchen island is painted a vivid blue, complementing the custom oil barrel pendant light in the dining room. 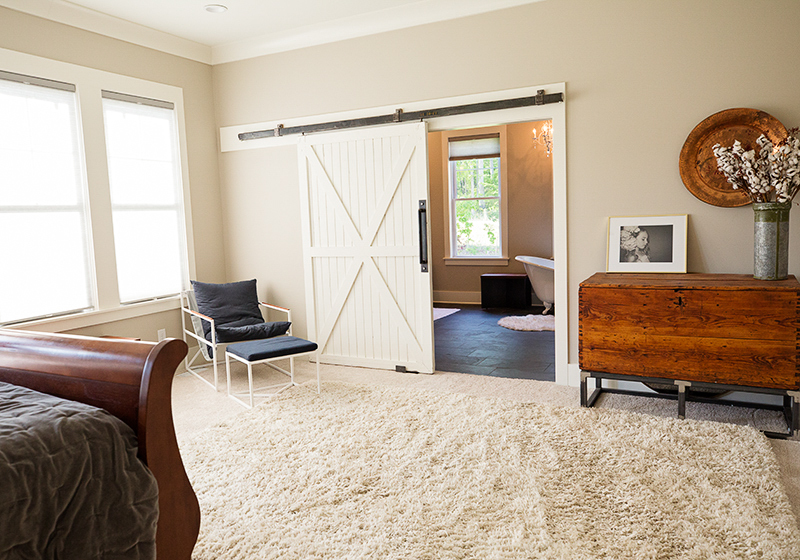 Another sliding barn door separates the master bedroom from the breathtaking master bath! 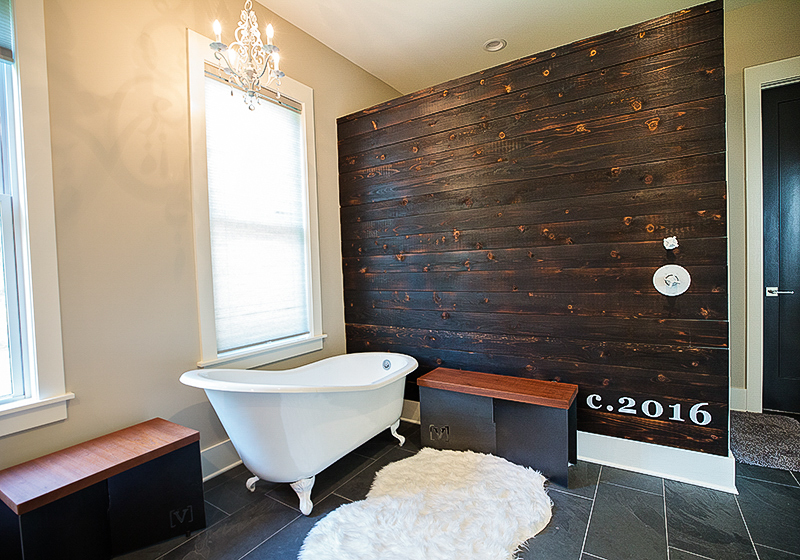 My favorite aspect of the master bath is the wood plank feature wall with the home’s build date painted on it! 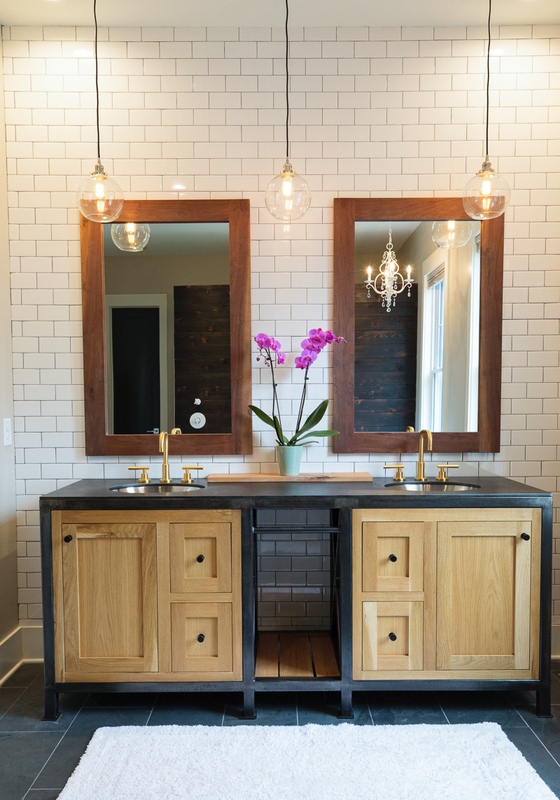 This adds such a cute, simple, and personal touch to the space! 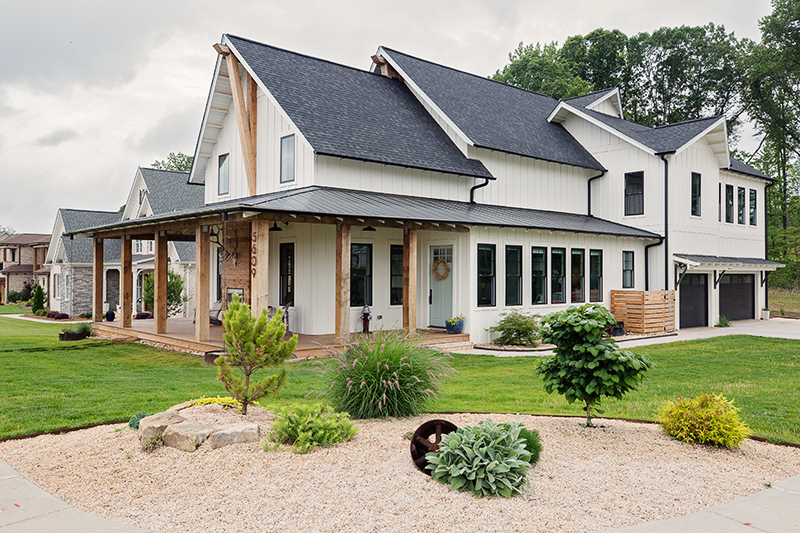 I love sharing unique and beautiful home design that inspires! A big thanks to Brian for reaching out and allowing me to share his home with all of you! 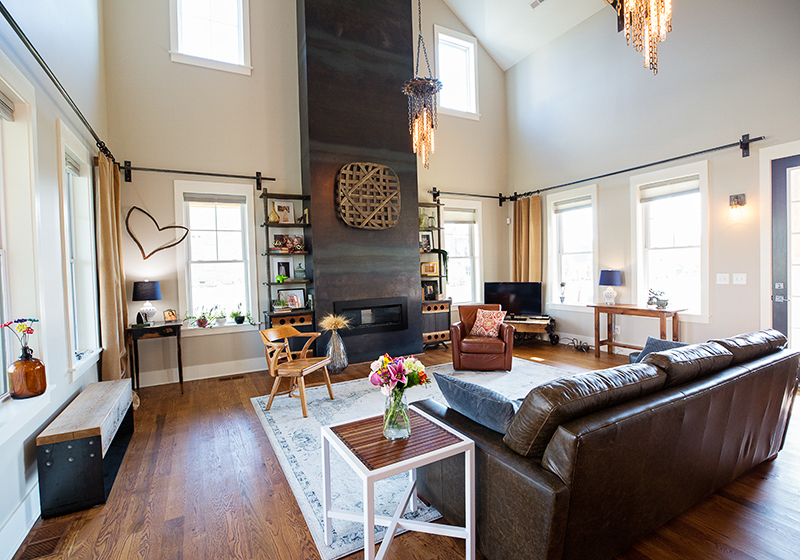 What’s your favorite part of the home? I’d love to hear. Let me know in the comments and feel free to pin this inspiration to Pinterest! I love the color of the front door. Can you tell me the pai t color? Thank you. Unfortunately I don’t know the name of this paint color. 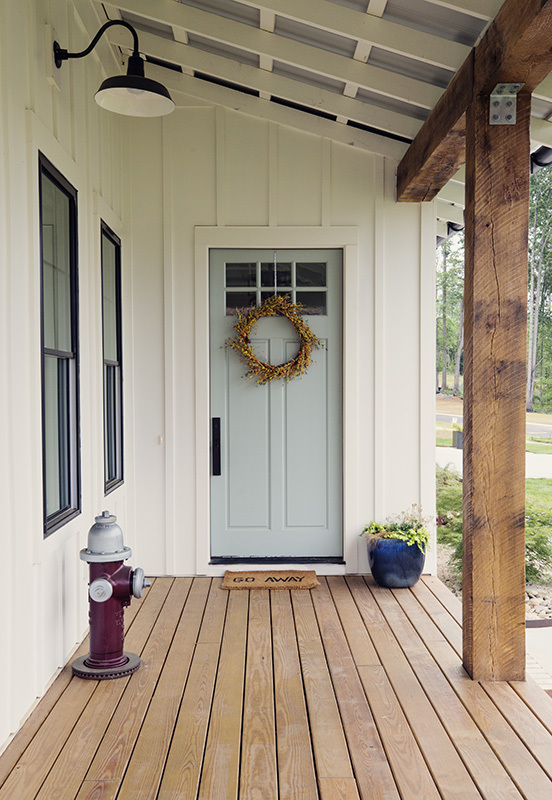 What color paint is this front door?